Are you looking for a weekend away? Plan a romantic couples getaway in Bayfield, WI! To help with your planning, we’ve come up with the the perfect itinerary. Arrive around mid-day and kick of your couples getaway in Bayfield with lunch at the Fat Radish. Check in to the Rittenhouse Inn where your comfortable and luxurious room awaits you – perfect for a nap! Relax and reconnect over the signature five-course gourmet meal with a nice bottle of wine and the lake views not far away. Stroll downtown to the end of the city dock for a bit of fresh air before retiring for the night. Sleep in before enjoying your two-course breakfast at the Rittenhouse Inn with plenty of great coffee to get your day off on the right foot. Hop on a mid-morning Madeline Island ferry ride, leaving your car at the Rittenhouse. 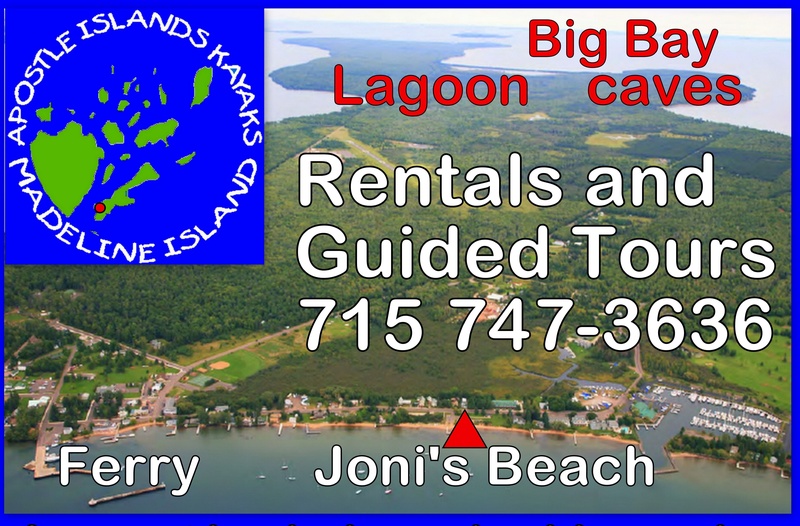 After arranging rental of a canoe or kayaks in town, rent mopeds or pedal bikes from Motion to Go on Madeline Island, picking up a picnic lunch from the Farmhouse before taking off for Big Bay Town Park, a 6.5-mile ride one way (on flat, paved roads). Find a quiet spot on Big Bay Town Park beach, canoe or kayak, rest, read, picnic, hike, swim, or just take in the views over the clear blue water. After biking back to town, experience Tom’s Burned Down Café for great people watching and an adult beverage before heading back on the ferry. If Tom’s isn’t your gig, try the Beach Club and grab a spot on the lakeside patio. Once back on the mainland, stop in to Bayfield Wine & Spirits for a great bottle of wine and some appetizer munchies to serve as dinner. Enjoy your book and that good bottle of wine from the Rittenhouse’s expansive front porch as you watch the world go by with Lake Superior in the distance. Take in a show at Big Top Chautauqua, the Carnegie Hall of tent shows, a short shuttle ride from the Rittenhouse. Sleep well in your Rittenhouse room during your romantic couples getaway in Bayfield! Wake up to a final breakfast in the Rittenhouse dining rooms before launching for the day. End your couples getaway in Bayfield, with a stop at one of the many orchards on your way out of town. Grab the fresh fruit of the season to enjoy at home. Use our itinerary or start planning your own! Either way, you will be sure to experience the best that our town has to offer during your romantic couples getaway in Bayfield! Book online today! For those who love to golf, Bayfield, Wisconsin and the surrounding area offers several choices for an unforgettable Bayfield golfing experience. Companions of golfers may enjoy these golf courses just as much as the golfer who’s up for the next challenge. With stunning views, rolling hills, fresh Lake Superior air, and affordable rates, we recommend you pack up your clubs and book your trip right away! Find your perfect room at our Bayfield, WI bed and breakfast and get ready for a golfing lovers getaway to remember. The Apostle Highlands Golf Course, located in Bayfield, Wisconsin, offers nine or 18 holes, carts or walking (not for the faint of heart – this course is built into a hill!). Golfers tee off over a water hazard in the shape of Lake Superior with the tee located in close proximity to where Bayfield is in relation to the lake. The course offers the challenge of rolling hills and blind drives. The view of Lake Superior, Michigan’s Upper Peninsula (on a clear day), and down the Chequamegon Bay can make one forgive and forget the challenges of the course. The facilities feature an onsite bar and restaurant as well as an event center, all providing prolonged views of Lake Superior and beyond. Check out the golf package options through the Old Rittenhouse Inn where you can dine and stay in style before, during, and after your day(s) on the course. For a different view of the lake, head the thirty minutes south to Ashland where you’ll find the Chequamegon Bay Golf Club. Only a mile from Chequamegon Bay (as the crow flies), this course also offers challenge and enjoyment for golfers of all skill levels. Choose to play either nine or 18 holes. An onsite bar and restaurant and pro shop round out the offerings. Adventure seekers enjoy taking the ferry over to Madeline Island to experience the Madeline Island Golf Club, a Robert Trent Jones-designed course. The MIGC is a private club allowing limited public play with prior arrangements and those wishing to walk onto the ferry (as opposed to driving your car onto the boat) can also make arrangements for a pick-up from and return delivery to the dock, courtesy of the MIGC. Hone your skills with a lesson from one of the club’s pros or just revel in the fact that you’re golfing on an island! As famous golfer Ben Hogan said “The most important shot in golf is the next one.” Make your plans to take the next shot in Bayfield, Wisconsin and the surrounding area. We’re confident you won’t regret it! The area surrounding Bayfield, Wisconsin caters to bikers of all skill and enthusiasm levels. Regardless of whether you are the occasional recreational rider or an avid biker, the Bayfield area offers numerous trails, rentals, plenty of entertainment and beautiful scenery. Imagine a day full of biking followed by a soak in the whirlpool in your Old Rittenhouse Inn room and a gourmet dinner overlooking the lake… ahhhhh…. Described as a place of “striking beauty and peaceful solitude,” the area surrounding Bayfield offers a plethora of trails and paved road cycling opportunities. Mountain bikers will want to check out CAMBA (Chequamegon Area Mountain Biking Association) which outlines the area’s off road bike trail system with 300+ miles of trails. Depending on where you are on the mainland, biking the area’s many paved roads can also be an option, though riders are of course encouraged to follow all safety guidelines and be fully aware of traffic. The North Coast Cycling Association (NCCA) provides trail maps, events, safety information, and much more at their website. Madeline Island, which is about the same size as the island of Manhattan (as a point of reference) is a popular biking spot for locals and visitors alike. Known for its relatively flat terrain, the island offers 27 miles of paved roads and several destinations for picnics, hiking, swimming, cliff jumping, kayaking, or beach relaxing in combination with a short or long-distance bike ride. The Madeline Island Ferry Line has a map and information on biking routes on their website, along with information on getting to Madeline Island from Bayfield. The Madeline Island Chamber of Commerce also offers plentiful information about the sights and sounds of Madeline Island, what to do, where to eat and how to get there. Visitors looking to rent bikes or mopeds while in Bayfield or on Madeline Island have a couple of options. In LaPointe (the only town on Madeline Island), check out Motion to Go, only a block and a half from the ferry landing, making for an easy walk-on-to-the-ferry excursion. You may also consider making arrangements to canoe or kayak at Big Bay Town Park as part of your Madeline Island adventure. Bayfield Bike Route also offers rentals for those looking to rent in Bayfield. Bayfield Bike Route is also your one-stop shop for bike repair. Using the trail maps mentioned above, or just seeing where the road takes you, explore Bayfield’s many vistas of Lake Superior, stop to enjoy the orchards, or just let the summer breeze blow through your hair as you take in the great outdoors on two wheels! At the end of your day, rest on the porch at our luxury Bayfield B&B with a beverage in hand and watch as the sun sets over Lake Superior. We look forward to your visit and helping you plan the perfect biking vacation – whether it is your main activity or a part of your overall itinerary. Bayfield, Wisconsin and the Apostle Islands offer fantastic options for kayakers of all ability levels. Whether you have your own kayaks and want to venture out on your own, or you are a novice seeking a guide and package offerings, kayaking in Bayfield is a great experience for everyone! Our great town has plenty of outfitters to help you plan a memorable trip. Below are the five reasons we believe kayaking in Bayfield and the Apostle Islands is a great option for travelers. 1.Gorgeous views… The mainland sea caves off Meyers Beach were made famous during the winter of 2013-2014 thanks to social media. The sea caves, naturally carved brownstone, provide a beautiful backdrop to Lake Superior and offer the option of paddling in and out whole staying relatively near the shore. Paddlers traveling on their own should exercise extreme caution when paddling in and around the caves. 2. The excitement of the big lake… Lake Superior is known as “The Boss” in these parts. Weather and lake conditions can change on a dime. The summer months (June – September) offer conditions ranging from calm to treacherous and everything in between. Experienced paddlers may embrace the challenge of the big lake while novice paddlers are wise to rely on a guide to judge lake conditions and offer alternative routes in calmer waters when warranted. 3. Pristine waters… As the largest fresh water lake in the world (as measured by surface area), Lake Superior can be crystal clear on the right day. Provided the winds haven’t whipped up the waves, paddlers can enjoy views of the lake bottom, ship wrecks, and the beauty of nature’s creations through the clear water. 4. Camping galore… The Apostle Islands National Lakeshore offers a variety of camping sites both along the mainland and on several of the 22 Apostle Islands. Advanced reservations are encouraged. Paddlers may choose to reserve a campsite on one of the inner ring islands and paddle themselves or use the Apostle Islands Area Cruise Service for transport to outer islands from which further paddling adventures can be made amongst those outer islands. 5. Wildlife in abundance… The Bayfield and Apostle Islands area is home to an abundance of wildlife. A plethora of birds, whitetail deer, fox, black bear, fish, coyote, beaver, and otter are among the wildlife making their home in the area. Eagles are spotted often amongst the Apostle Islands and other creature sightings are not uncommon. Experience the beauty of Bayfield and the Apostle Islands by planning your next trip to the northern shores of Wisconsin. During your strip. stay with us at our romantic Bayfield, WI bed and breakfast. We offer 20 guest rooms and a private cottage with fireplaces, whirlpool tubs and spectacular Lake Superior views. Book online today! Be sure to check out our great kayaking packages when planning your stay and refer to the Bayfield Chamber of Commerce’s listing of outfitters in the area. The Old Rittenhouse Inn website, Apostle Islands National Lakeshore and the Bayfield Chamber of Commerce can also provide helpful information. If you are heading out on your own please be sure to file your itinerary with the appropriate local organizations and check, double-check, and re-check the weather before heading out.